Explore the bends and corners of the Mashi River as it winds along the Zambian / Angolan boundary. After an early morning breakfast, you will depart homewards. Accommodation will be in mobile safari camps which are built up from scratch every year and then broken down completely at the end of the season. Each angler will have their own 3m x 3m bow tent with a proper bed, linen, towelling, bedside tables and solar lanterns. The 2 ablution blocks are equipped with hot water, high pressure showers, sinks and flushing toilets. We dine beneath the stars and trees and our “lounge” remains the ring of comfy lounge safari chairs around the roaring fire looking over the floodplain. Early morning coffee around the campfire as the hornbills leave their floodplain roosting spots is enjoyed before you get on the boats (loaded with ice cold drinks and packed lunches) and head onto the main channel of the Kwando or Mashi river. Your guide will then find a promising bend and you can start drifting silently fishing towards the structure or work a quiet backwater for bream. Groups can either return for brunch and a snooze or enjoy a full day exploring this wonderful fishing wilderness and untouched waters accompanied by numerous different bird species. We return to camp before last light, enjoy showers and dinner beneath the African stars. July 2015 was the first time this part of the river called the “Kwamashi” by locals was ever fished and it was superb. All our guests commented on how much harder and longer the tigers fought for when compared to the Zambezi tigers. However, it is important to note that this is not a MONSTER tigerfish destination (ie. unlikely to find fish over 15 lbs). What it does offer is fantastic, consistent action for hard fighting fish in the 6-14 lb range who are very keen on lures and flies with Fat Raps and Effzetts being very effective. We offer the attached list of suggested extras as a guideline, based on 15 years of fishing observations. New trends, equipment and items should always be considered. View your Fishing Tackle Requirements here. 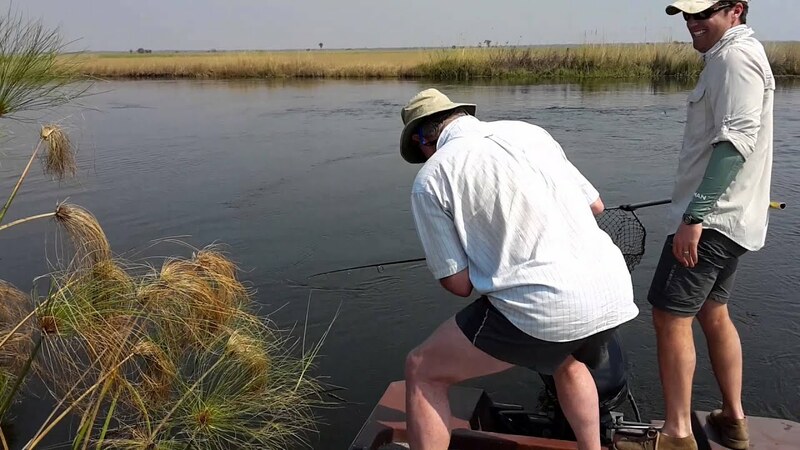 The Kwamashi fishing safari takes place on the Kwando River – located in the south western region of Barotseland. Fly in via charter plane from Livingstone, Zambia OR Lanseria, South Africa to Mutemwa Airstrip. Single accommodation, all meals, teas and coffee, laundry, unlimited guided fishing with unlimited fuel, selection of fishing tackle. Flights and road transfers, drinks, broken or lost fishing tackle.